No doubt you have access to a few candy hearts right about now. I know I do, so instead of gobbling them up, I decided to turn these sweet pastel treats into an art project. 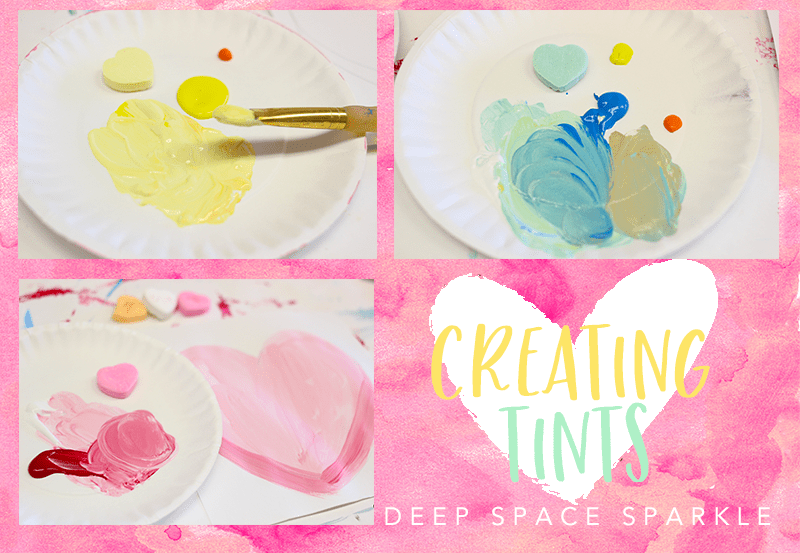 This candy hearts lesson is a great way for kids in grades 3 and above to observe a color and try to replicate the value. You can free-draw the heart or use a template. The older the child, the easier it is to draw a large heart. Drawing a heart big enough to paint inside is the goal so if you notice that some children are struggling with drawing the heart, use a template. 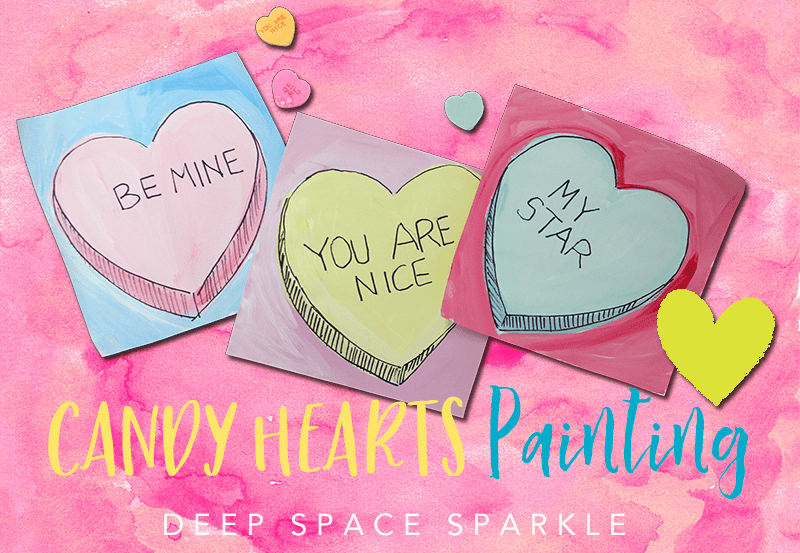 Grab some liquid tempera paints, paper plates, 6″ white paper squares, a pencil, a black marker and of course, a few sweet heart candies. Tints are created by mixing white to any hue (color). This might seem rather boring but I tell you, kid’s LOVE watching white paint do it’s magic on a color. It really is all about the paint mixing here, so if you can give each child a small paper plate in which to explore the painting mixing, please do. Place a quarter size dollop of white paint in the center of each child’s plate. Place a candy heart (random colors) on the plate and then squirt a dime-sized dollop of the candy color on the plate too. Some colors like light teal require three colors: white, turquoise and yellow. For older students, using COMPLEMENTARY colors adds an authentic darker tone or SHADE to use as the contrast. Although, it just might be easier to use less white for the darker parts of the candy hearts. Mix the white and colors together until the color is the same as the candy heart. Painting the heart is very quick because the paper size is small (6″ x 6″). This allows the child to create more than one heart. If you are doing this lesson with younger kids (ages 6-8) use a larger 10″ x 10″ paper. The bigger area is more forgiving. Where the shadows lies on the heart, use a darker color to add as the contrast. When the heart is done, consider adding a Complementary Color to the background. This step is optional but very effective for older students (age 9 and up). When paint is completely dry, outline hearts with the black marker. Use cross-hatching to indicate the sides of the candy heart. Then, if the kids want (and they will! ), add a favorite quote. 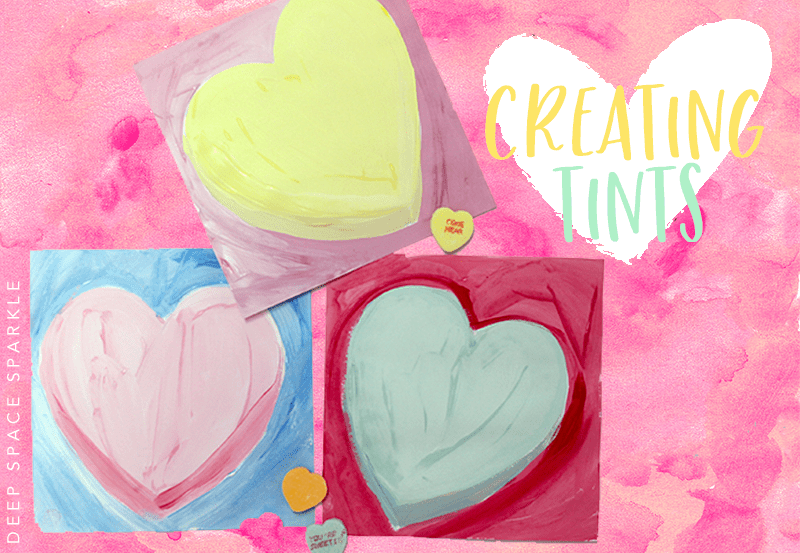 To help with this lesson, click the button below to download a PDF that contains a TINT color Wheel, a HEART template and a TINT & SHADE worksheet for your students. Love these! I may have the kids cut the hearts out and put them in pop-up cards… or these would make a really nice Any Warhol study! Edit – Please disregard above comment. I checked my email and there it was! Thank YOU! This is fabulous — I did this with my second graders and it was a big hit! How does the Access PDF work? I got a welcome email, but no pdf. Nor did it take to to a page with a pdf after I typed in my info.